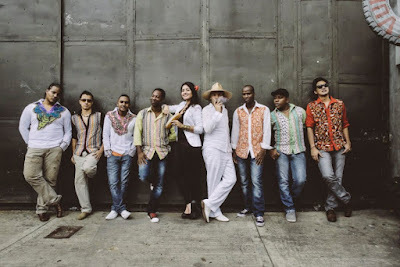 La Mambanegra (pictured above) is a new group from Cali, Colombia flavoring indigenous sounds with 70s NYC salsa, dancehall, funk and hip hop. Dos Santos Anti-Beat Orquesta is a hard-rocking new pan-Latin American cumbia band from Chicago. Both these outstanding combos are making their Global A Go-Go debuts on this week's program. Also this week: deep grooves from Mali, Italy and New Zealand; more fabulous Senegal 70's sounds; coupe decale keeps on keepin' on.